You can see the top was pretty messed up. There were tons of stains and scratches that needed to be fixed. The worst part was the Sharpie all over the pull out tray. I knew I could fix it all and make something unique with a bit of work that is. I started with the top. I sanded the top down, starting with 80 grit. I needed to get down a few layers to get rid of the staining. Once that was done, I moved on to 120 then finally to 220 grit sandpaper. It was nice and smooth and the discolorations were all but gone. Now it was time to stain the top. 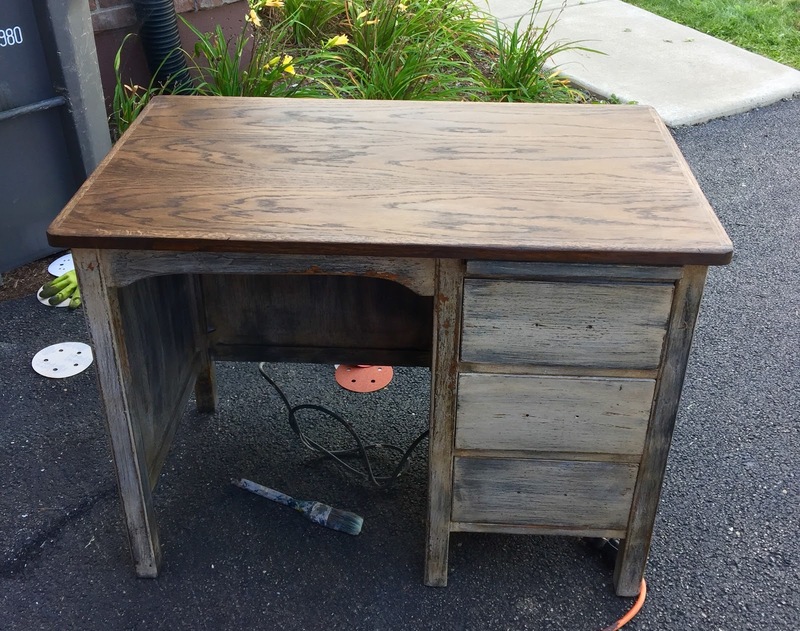 I used a mix of Red Mahogany and Kona stain. Next step was paint. 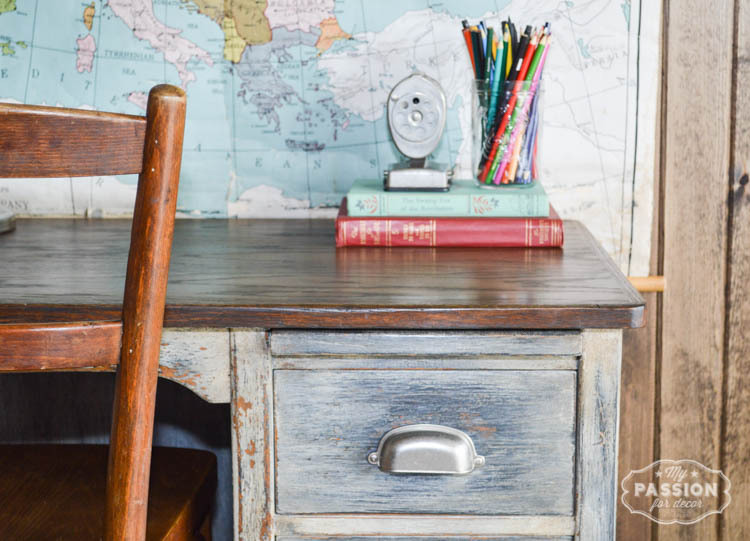 I started with a base coat of Miss Mustard Seed's Milk Paint in a mix of Typewriter and Ironstone. I applied two coats and then waited to see what would happen. The nerve wracking part of using milk paint is where is will peel and if it will peel at all. Sure enough the paint chipped in a few areas. I sanded the desk paying attention to the chippy parts. 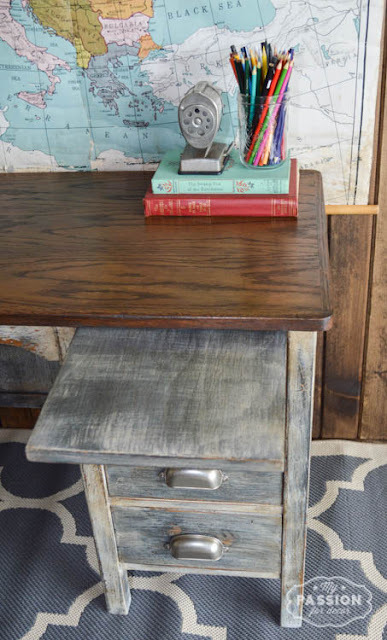 When I was done with the sanding I went over the whole desk with a wash of Vintage Linen DIY Paint. Then I gave the entire desk another sanding and a coat of dark and clear wax mixed. 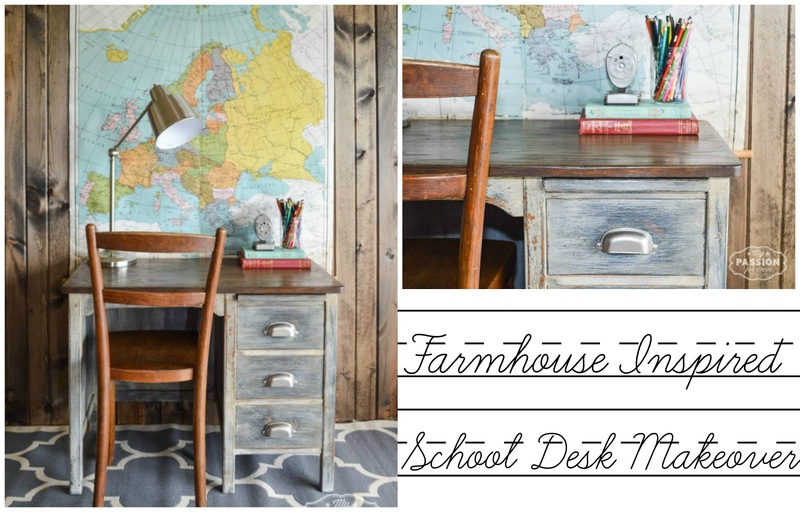 I wanted a farmhouse look, but a touch of modern in there. I really love how it all came together. 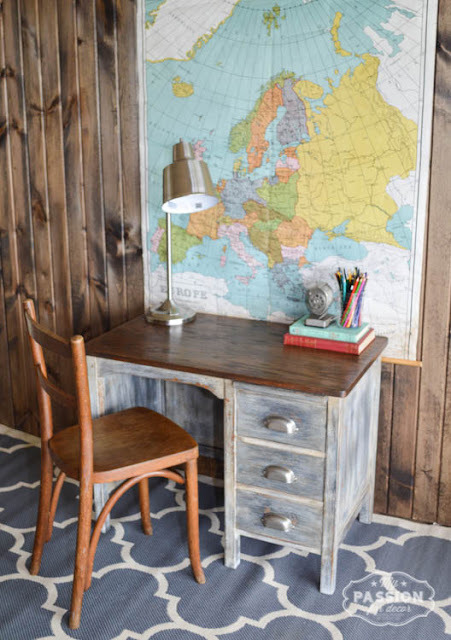 The drawer pulls are just what this desk needed. I have a bit of a crush on this desk! 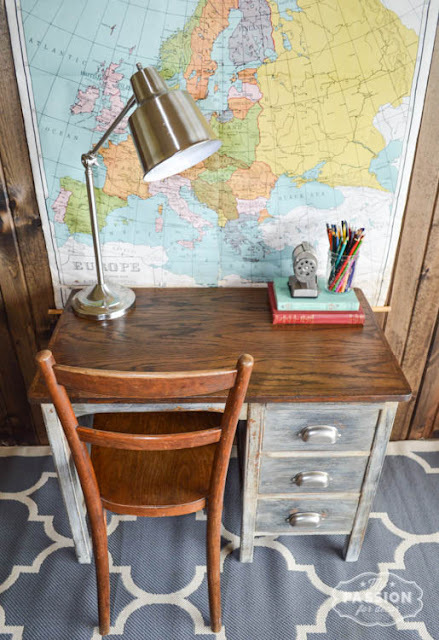 I seem to keep finding these kid's desks, maybe someone is trying to tell me something. If they are I have no idea what they're trying to say! 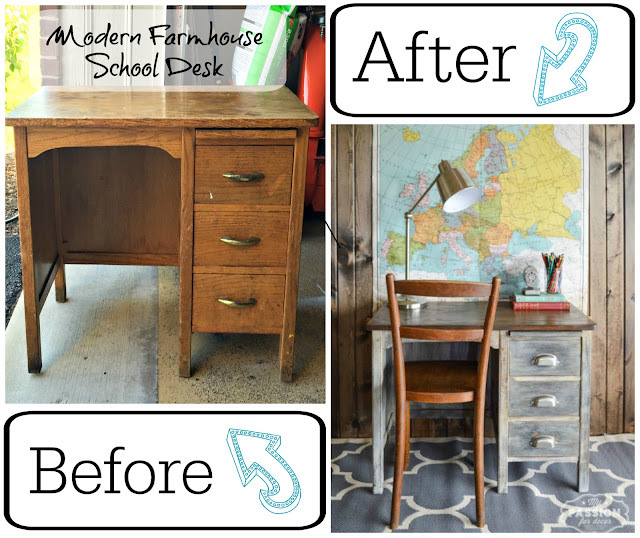 I'm hoping this Modern Farmhouse desk finds a happy home!! 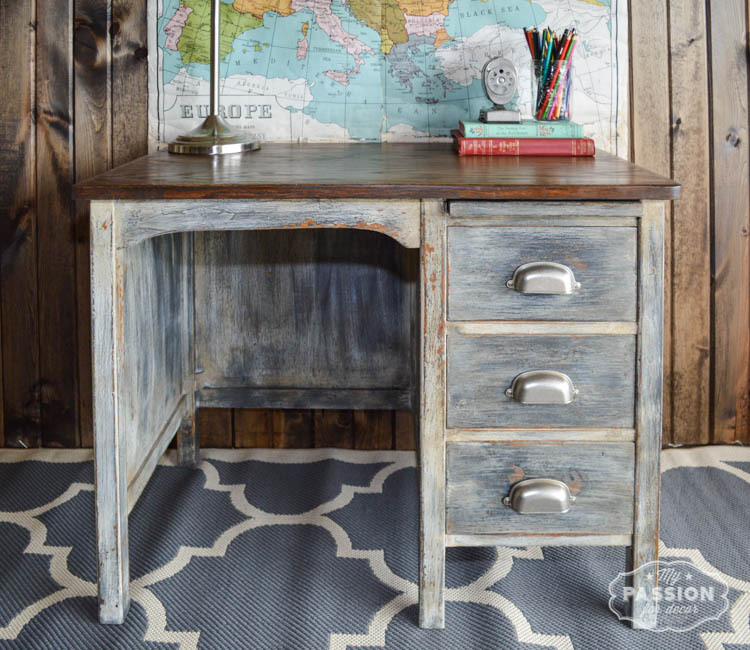 That is one pretty desk.At first I thought you had put back chalk paint on it and filled it with chalk... but when I saw the close up I realized that there was beautiful wood peaking out from underneath. Bravo very nice job. 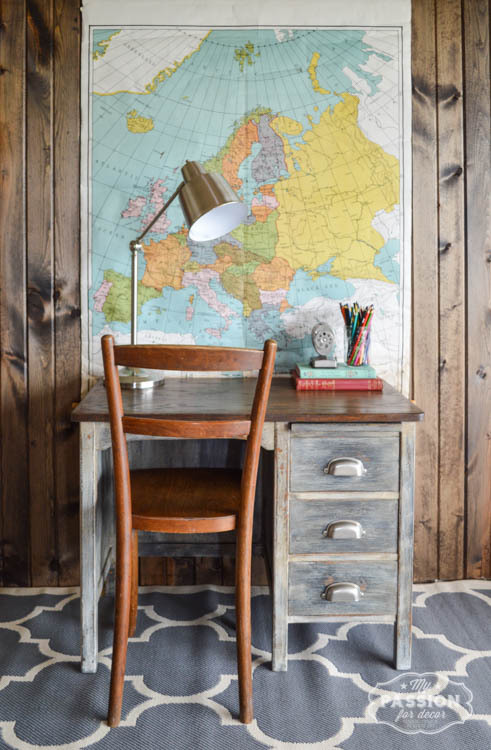 Your work on this desk along with the styling is amazing.